Week 15 in the NFL kicks off on Thursday night from Atlanta, where the Falcons (8-5) face a pivotal game for their playoff hopes against the Jacksonville Jaguars (4-9). As things stand now, Atlanta would be the top wild-card team in the NFC thanks to the Bears getting Tebowed on Sunday in Denver. Atlanta still has a shot at repeating as NFC South champion but trails New Orleans by two games – the two face off next Monday night in the Big Easy. The Jags are just playing out the string, although interim coach Mel Tucker is auditioning for the full-time job. Atlanta coach Mike Smith had a bit of a health scare after Sunday’s 31-23 come-from-behind victory at Carolina. Smith was taken off the Falcons’ charter plane back to Atlanta and went to a Charlotte hospital because of chest pains. But it wasn’t a heart attack and Smith will be coaching in this one. The Falcons looked lousy for the first half against the Panthers, trailing 23-7 at intermission. But QB Matt Ryan blew up in the second half, throwing for 232 yards and three scores – the clincher was a 75-yard score to rookie Julio Jones. It was the 16th fourth-quarter comeback win of Ryan’s career and Atlanta is 21-0 in Ryan’s career (5-0 this year) when he has a QB rating of at least 100. Atlanta is 22-5 when he throws multiple touchdowns. It was only the second time in team history that the Falcons won a game in which they trailed by 16 or more points on the road at halftime. The Falcons are now 17-3 (.850) following a loss since Smith arrived in 2008. In an odd twist, this will be the fifth week in a row that the Falcons defense faces a rookie QB, following the Titans’ Jake Locker (took over in the third quarter of that game), Vikings’ Christian Ponder, Texans’ T.J. Yates and last week the Panthers’ Cam Newton. Of course, the Jags start rookie Blaine Gabbert. Speaking of Gabbert, he had probably his best game so far in Sunday’s 41-14 win over Tampa Bay. He finished 19-of-33 with 217 yards with two touchdowns and two interceptions. The Jags were down 14-0 but scored 28 points in a 7:32 span of the second quarter. That’s pretty remarkable for a team that hadn’t scored 20 points in a game all season and it was the first time since 2007 that the Jags scored 40. For only the second time in franchise history, the Jaguars scored on offense, defense and special teams. Jacksonville also forced a team-record seven turnovers. 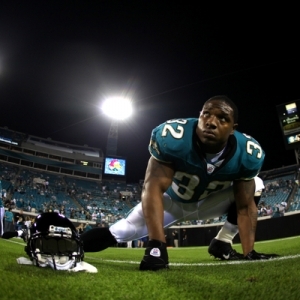 Running back Maurice Jones-Drew scored a career-high four touchdowns. Jacksonville may have to sign a kicker this week. Josh Scobee tweaked a groin injury before Sunday’s game. He kicked extra points following the first five touchdowns, but the Jaguars opted to go for a first down on fourth-and-nine late in the game. When the Jaguars scored a touchdown on that drive, they attempted a two-point conversion. And linebacker Russell Allen handled the kickoff after that score. The Jaguars already are incredibly weak at receiver and may be without starter Mike Thomas in this game. Thomas, who leads the team with 40 catches for 391 yards, took a blow to the head in the first half of Sunday's win and never returned. Whenever a Jaguars player had concussion-like symptoms this season, he has sat out at least the next game or longer. Fellow WR Cecil Shorts also is in question after suffering a hamstring injury. The Falcons emerged from Sunday in good shape injury-wise. However, top cornerback Brent Grimes is likely to miss a third straight game. Certainly MJD will be the key here as it’s unlikely to expect a second straight good game out of Gabbert considering he has yet to do that and it seems likely that Thomas sits. Jones-Drew leads the NFL in rushing yards, but the Falcons are No. 5 at stopping the run. Jacksonville and Atlanta haven’t played since 2007, although they did face off in an exhibition game back in August (a 15-13 Jags home win, for what that’s worth). Atlanta opened as an 11-point favorite with the total at 41.5 on NFL odds. The Jags are 5-7-1 ATS this season and 2-3-1 ATS on road. The Falcons are 5-7-1 ATS and 2-3-1 ATS at home, so something has to give here. ‘Over/under’ records: Jaguars 3-10, Falcons 4-9. Jacksonville is 0-3-1 ATS in past four following a win. The Falcons are 1-4 ATS in past five after scoring at least 30 points in previous game. The ‘under’ is 6-0 in Jags’ past six vs. teams with a winning record. The ‘under’ is 6-1 in Atlanta’s past seven as a favorite. Jacksonville has yet to win back-to-back games this season, and I see no reason why it would start now. The Falcons won’t let MJD beat them, and I can’t see Gabbert doing a whole lot in his first start on such a quick turnaround and in the noise of the Georgia Dome. This looks like a 27-10 Falcons win, so take Atlanta and the ‘under’. Strike Point Sports is destroying the bookies with their NFL picks. A 3-0 sweep this past weekend has helped their clients to 10 of 15 winning NFL weeks, including three of their last four. They will have a big card coming this weekend. Click Here for more info.